The 42 reign of Gaddafi seems to be coming to an end. Egypt is up in the air and Syria faces major revolts. Even Jordan has been affected by demonstrations against the government. 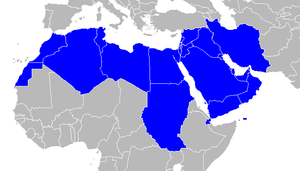 The whole Muslim Middle east and Northern Africa is in the state of flux. How it will all end nobody knows. One thing for sure, we need to be praying for the people and for the Gospel to finally be free to touch the lives of 100’s of millions presently subjected to the darkness of Islam. These nations are obviously being shaken for a purpose. At the same time, we know that in many of these nations there is an on-going illegal ‘secret revival’ where millions of Muslims are becoming followers of the real Jesus through dreams, visions. and healings. There is a shaking going on among the nations. Charismatics and Pentecostals give lip service to the idea that God is really in charge of events going on around the world. "Son of man, I have made you a watchman for the house of Israel; therefore hear a word from My mouth, and give them warning from Me." Numerous signs, wonders, and healing marked the meetings as Buchan challenged men to become godly leaders in their own homes and to change their lives. Here’s an incredible report from Bonnke’s Christ for All Nations org. 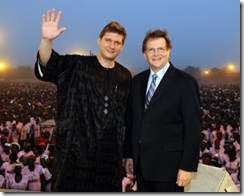 that their most recent Nigeria crusade saw over 360,000 people come to Christ in 5 days. Included were some Muslims who had participated in the attacks on Christian villages near Jos, Nigeria. Also hundreds were healed during the meetings. Evangelist Daniel Kolenda and CfaN founder Reinhard Bonnke (See photo above) were the major leaders of the crusade held at Takum, Nigeria in March 24-28. Response: The harvest and revival continues in Africa in a big way. Africa is now evenly divided between Muslims and Christian. Islam is expanding through jihad while the Christian harvest continues through signs, wonders, and healing.